Posted on Fri, Mar 16, 2012 : 8:25 p.m.
AnnMarie Gilbert had a hunch. Her Eastern Michigan women’s basketball team was going to play Georgia in the first round of the NCAA Tournament. The hunch was so strong, she started taking notes on a replay of a Bulldogs’ game she found online. Later that night, the Mid-American Conference tournament champions gathered to find out their NCAA fate. The Eagles (23-8), seeded 12th in the Fresno regional, drew No. 5 South Carolina (23-9) in a first-round game at 11 a.m. Saturday at Purdue University’s Mackey Arena in West Lafayette, Ind. 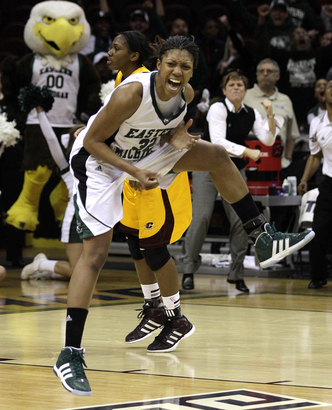 Eastern Michigan senior Paige Redditt celebrates her game-winning shot in last week's MAC Tournament title game, which sent the Eagles to the NCAA Tournament for the second time in school history. Not all of Gilbert’s efforts were wasted, however. The game she was watching: Georgia vs. South Carolina. And what she saw didn’t surprise her. Grant and Sutton, a pair of seniors, lead the Gamecocks in scoring with 10.6 and 10.5 points per game, respectively. The Eagles counter with Tavelyn James, the Mid-American Conference Player of the Year and the second-leading scorer in league history. The senior guard from Detroit Mumford High School led the Eagles with 24.2 ppg. Saturday's winner faces the Purdue-South Dakota State winner in the second round. Staley, who recently was named to the WNBA’s Hall of Fame and a member of three U.S. Olympic gold medal teams, only has reached the second round twice in six previous NCAA trips as Temple's head coach. South Carolina (23-9) is in the NCAA Tournament for the first time since 2003. The team reached 20 wins for the first time since it last played an NCAA game nine years ago. It went 10-6 in the SEC, also the high-water mark of the past decade. There was also the Gamecocks' 64-60 victory over Tennessee last month, which ended a 40-game losing streak that spanned three decades. This is Eastern Michigan's first NCAA Tournament appearance since it lost in the first round to Boston College in 2004.